Robert Stacy-Judd's classic 1939 book on Atlantis is back in print in this large format paperback edition. Stacy-Judd was a California architect and an expert on the Mayas and their relationship to Atlantis. Stacy-Judd was an excellent artist and his book is lavishly illustrated. The eighteen comprehensive chapters in the book are: The Mayas and the Lost Atlantis; Conjectures and Opinions; The Atlantean Theory; Cro-Magnon Man; East Is West; And West Is East; The Mormons and the Mayas; Astrology in Two Hemispheres; The Language of Architecture; The American Indian; Pre-Panamanians and Pre-Incas; Columns and City Planning; Comparisons and Mayan Art; The Iberian Link; The Maya Tongue; Quetzalcoatl; Summing Up the Evidence; The Mayas in Yucatan. Tons of great illustrations in this big book. 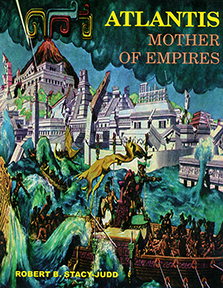 Atlantis: Mother of Empires, by Robert Stacy-Judd. 340 pages. 9x11 Paperback. Illustrated, maps, references, and index.